Tear the lettuces into large pieces and place in a serving dish or bowl. Whisk the olive oil, xylitol, white wine vinegar, parsley, and oregano in a small bowl until completely blended. Season with salt and pepper to taste. Peel and stone the avocados and then slice. 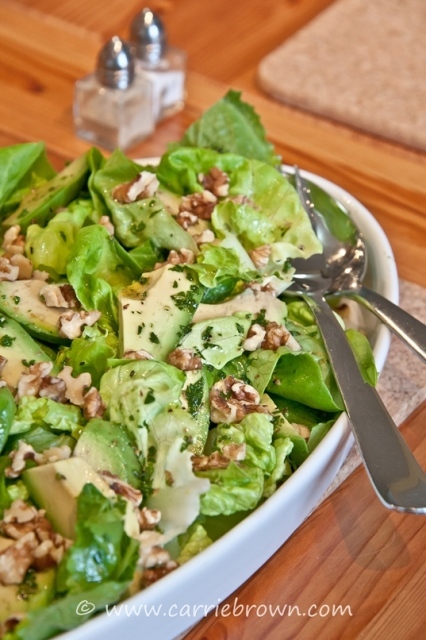 Add avocado slices to the dressing and carefully turn to coat them. Spoon the avocado slices evenly over the bed of lettuce. Sprinkle the walnuts evenly on top.